Contacts are an excellent solution for those suffering from bad vision. Contacts can help you to stay active and fully enjoy your life, without changing your visual appearance. This makes them a common choice for people that are not interested in wearing glasses. What is important to note is the need for properly caring for your contact lenses. If you don’t take care of your contacts, you could cause permanent damage to your eyes. Dirty or torn contact lenses can cut your cornea, causing pain and eye distress. Wash your Hands. Never touch your contacts without first washing your hands. Otherwise, you can transfer dirt and germs onto your contacts. Use soap and water then dry your hands with a towel that won’t leave any lint or residue on your fingers. Avoid Water. Water is good for you, but not for your contacts. You should avoid wearing your contacts in the pool or shower. Also don’t store them in water. Use a specific contact solution instead. Contact Solution. Use contact solution for washing and storing your contacts. We recommend squirting contact solution on your freshly cleaned hands, placing the contact inside the solution and rubbing it to remove any dirt or debris. Rinse with the contact solution and repeat to make sure you have removed all of the dirt. Rinse again than store in your contact solution. Protect your Contact Solution. Make sure to cover the cap after every use and do not transfer your solution to a smaller case. You will risk infecting the solution if you allow it to come in contact with anything. Clean Lens Case. You should store your contacts in a clean contact lens case. Clean it at least weekly by rinsing with water, remove any dirt, and fill your case with fresh contact solution on a daily basis. Replace your case quarterly. Wear as Directed. It is extremely important that you wear your contacts as directed. The staff at Heritage EyeCare will give you instructions on how frequently you need to remove your contacts and when they need to be replaced. Wearing your contacts for too long can cause damage to your eyes. Additionally wearing contacts past the expiration date is not smart. We recommend having a pair of backup glasses to give your eyes a rest and to help you avoid wearing them longer than you should. Each type of contact lens comes with different instructions, so a consultation is important for establishing your contact care routine. Stay Hydrated. Keep your eyes healthy by keeping them clean and moist. Staying hydrated is an important part of eye health. Drink plenty of water throughout the day and blink as needed to keep your eyes from drying out. Rest your Eyes. Your eyes need rest as tired eyes will cause blurred vision, putting additional strain on your eyes. Avoid staring at the computer for prolonged periods of time. Take a break, close your eyes, and stare off into the distance for 20 seconds to give them a much needed rest. Contacts are an excellent option for correcting your vision. 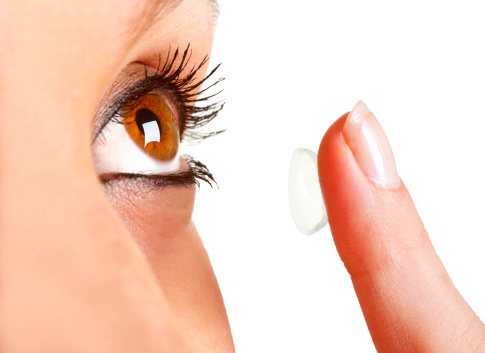 At Heritage EyeCare, we carry a variety of contact lenses and can help decide which ones work best for your lifestyle. We will provide you with specific instructions on caring for and maintaining your contacts so that you can stay in optimal eye health.